A dental sealant is a thin plastic coating applied to the grooves on the chewing surfaces of healthy, decay-free teeth. Sealants create a physical barrier that literally “seals out” the food and bacteria that cause tooth decay. Properly applied, sealants are 100% effective at preventing tooth decay. Eventually, 95% of people develop one or more cavities. Sealants are most often used on the back teeth, which are the teeth at most risk for decay and cavities. These teeth have deep grooves that are too narrow to be reached by toothbrush bristles. Because these grooves and fissures are difficult to clean, food and bacteria can become trapped there. Although fluoride is a great tool in the arsenal against tooth decay, it only works on the smooth surfaces of the teeth. When it comes to protecting the grooves of the teeth, sealants are most effective. Sealants are a very cost effective preventative measure used by comprehensive family dentistry to help you and your family maintain your dental health. Sealant protection for one tooth typically costs less than a traditional amalgam (silver) filling costs and just a fraction of the cost of a root canal or crown restoration. The protection provided by sealants usually lasts for many years. Both children and adults can benefit from the added protection sealants provide. Children benefit greatly from sealants for several reasons. The enamel on a newly erupted tooth takes a full three years to mature. This leaves young teeth especially vulnerable to decay. Children also sometimes have difficulty maintaining good dental hygiene. However, it is never too late for sealants—adults are also at risk for tooth decay and should consider sealants, especially when they have risk factors for cavities. To maintain dental health for children with new permanent teeth and to prevent future dental problems in adults. To save time and money in the long run by preventing tooth decay—especially when risk factors are present (for example, history of cavities, poor oral hygiene, dry mouth conditions and low fluoride intake). Sealants are highly durable and can remain for many years. However, as with most dental work they may someday require repair or replacement. Only one brief appointment (30 to 60 minutes) is required to seal all of the back teeth. First, the teeth will be thoroughly cleaned with air abrasion. Your dentist will then apply an etching solution to roughen the surface of the teeth so the sealant material can better adhere. The chewing surfaces are then thoroughly dried and the sealant material carefully applied to the grooves of the teeth. An ultraviolet light or laser is used to harden the material so it is firmly bonded to the teeth for a tight protective seal. After a careful inspection to ensure that the seal is secure, your procedure is complete. At Falmouth Dental Associates, we use the latest technology and finest materials available in comprehensive family dentistry to offer sealant procedures that are quick, comfortable and effective. 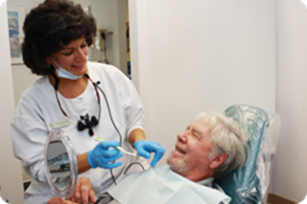 We will provide instructions for the care of your teeth after treatment. While sealants are extremely effective in helping prevent cavities, proper oral hygiene, good eating habits and regular dental visits are necessary to aid in the life of your teeth. Feel free to contact us if you have any questions about sealants or to schedule an oral health consultation with one of our doctors.